Almost every time there is a major release I test for specific things that might be interesting. For example, In the scoreboard.dat file, There is a “Prefix” and a “Suffix” when you create a team. In this example, I’ve created a team called [Owner]. Using a program called NBTExplorer, I’m able to modify the “Prefix” and “Suffix” of a team, and this is where this string comes in. 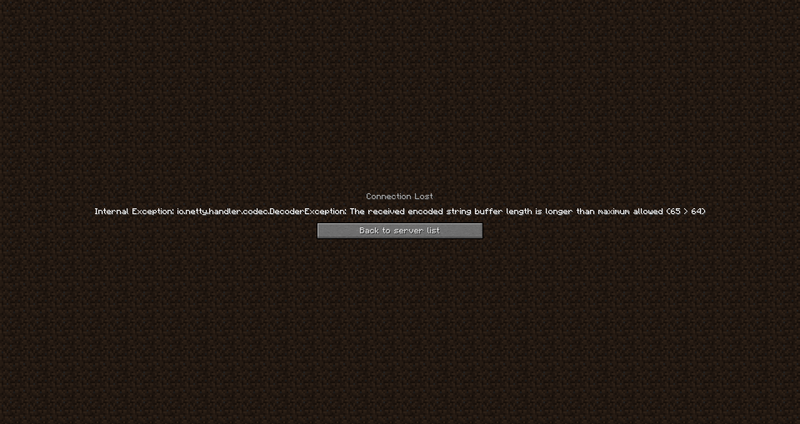 This string is 65 characters long according to the Minecraft Client and Server. Now we’re going to take the same string as above and remove one character ‘r’. From Minecraft 1.5.x to 1.10.x - All scoreboard limitations are 16 characters and based on from what I’m gathering this increased to 64 characters. Currently, in these versions, it would show Character Count > Maximum Account. In Figure A. it’s showing 64 characters is the maximum amount allowed in a Prefix or Suffix. However, something is not being updated, and it’s likely client-side. In Figure B. we just removed one character, and it’s showing the maximum amount characters is 16 which is the current standard. In the image below it shows us connecting to the server ~64 characters. Therefore, it seems like it’s server-side accepted. However, the client could be rejecting it. Lastly, the character count system is a bit off. If you noticed the string I mentioned: “This string is 65 characters long according to the Minecraft Client and Server.” Well, that’s because that’s what Minecraft is detecting it as, however, if you count the characters it’s 56, this includes the 2 for color codes and spaces.